Experimental Biology (EB) 2014 took place this week in San Diego. Scientists and researchers in the fields of anatomy, biochemistry, nutrition, pathology, pharmacology and physiology convened for this annual meeting where dairy had a large presence. Most notably, the American Society for Nutrition hosted its Second Global Summit on the Health Effects of Yogurt on the last day of EB, which was April 30. The event was hosted by The Yogurt in Nutrition Initiative for a Balanced Diet (YINI) with the American Society for Nutrition (ASN), Danone Institute International and International Osteoporosis Foundation (IOF). Building on last year’s conversations, scientists discussed a variety of issues, from looking at new research about the association between yogurt consumption and Type 2 diabetes to analyzing how yogurt can help play a role in improving dairy consumption in young adults. Sharon Donovan, Ph.D., former president of ASN and co-chair of YINI, helped guide the summit proceedings. “This work is crucial,” she said, “especially in light of the global shortfall of dairy consumption. From China to Brazil to the United States, the majority of people simply aren’t eating enough dairy to meet their countries’ daily recommendations. “Although eating practices and lifestyles differ throughout the world, dietary guidance for dairy food consumption is surprisingly consistent. However, when it comes to that same dairy recommendation, some countries are doing better than others,” Donovan noted. For example, in France, 97% of the population is meeting the recommendation for daily dairy intake, while in the U.S., that number is at only 52%. Other countries that are doing better than the U.S. in meeting their government’s daily dairy consumptions include Italy (70%) and Spain (62%), while China and Brazil are lower than the U.S., at 16% and 41% respectively. Adding yogurt to the daily diet would help close the gap between recommendations and actual dairy consumption. For instance, adding a single 8-ounce serving of fat-free or low-fat yogurt would help increase the average U.S. daily dairy consumption to 84% of the recommended three servings per day. A new study presented as the Summit shows that only 14% of adults and 20% of children in the U.S. consume at least three servings of dairy a day, which is the amount recommended in the current Dietary Guidelines for Americans. Nutritionist and best-selling author Ellie Krieger was on hand to offer up easy solutions to help people reach the recommended dairy goal. “While most people consider yogurt a healthy snack, they don’t know the many ways that yogurt can be incorporated into recipes to make meals more nutritious,” Krieger said. “Given the right tools and knowledge, anyone can attain a healthy balance with their lifestyle practices and reach dietary goals.” Krieger previewed foods from her latest book Weeknight Wonders, a collection of healthy, delicious recipes using simple ingredients such as yogurt. Consumption and healthy behavior. Mauro Fisberg, M.D., Ph.D., Federal University of Sao Paulo, Brazil, examined the history of yogurt and consumption, noting that one of the most important modifications of yogurt in modern times is the global spread of ready-to-eat products for children and yogurt with probiotics. He noted differences in yogurt consumption around the world: traditional European countries, Asian and Russian sphere influence regions have higher consumptions while regions with high lactose-intolerance levels have low intake of dairy products, leading to very low calcium intake. Fisberg also reported that because of the increased acknowledgement of yogurt as an essential food in some developing countries, there is a growing tendency towards consumption. Yogurt is seen as an important source of calcium and protein and not only as a snack or a dessert. The live cultures in yogurt improve lactose digestion of the product in individuals who have difficulty digesting lactose. Type 2 diabetes. Nita Forouhi, Ph.D., University of Cambridge School of Clinical Medicine, U.K., reported that researchers in the U.K.-based EPIC Norfolk study analyzed the relationship between higher consumption of low-fat fermented dairy products and diabetes over 11 years, compared with non-consumption. Low-fat fermented dairy products largely (87%) consisted of yogurt, but also included unripened cheese, such as fromage frais and low-fat cottage cheese, in a middle-aged population in the U.K.
Yogurt consumption and weight management. Angelo Tremblay, Ph.D., Department of Kinesiology, Laval University, Canada, presented findings regarding the impact of yogurt on appetite control and energy balance and body composition. In a study of nutrition in adult women in the U.S., the authors (Gugger, C.K., et. al.) performed a two-year analysis of the relationship between regular consumption of yogurt and BMI. Another (Miguel A. Martinez-Gonzalez, et. al.) reported on a longitudinal study from Spain that examined the association between frequent yogurt consumption (at least one serving a day) and the onset of overweight and/or obesity. Yogurt and cardiovascular disease risk in children and adolescents. Luis Moreno, Ph.D., professor of Public Health, University of Zaragoza, Spain, reported on research that measured cardiovascular disease risk factors in 511 adolescents from nine European countries (Greece, Germany, Belgium, France, Hungary, Italy, Sweden, Austria and Spain) who participated in the cross-sectional HELENA (Healthy Lifestyle in Europe by Nutrition in Adolescence) study. 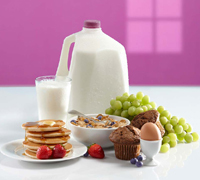 The importance of milk proteins in elderly health status. Robert R. Wolfe, Ph.D., University of Arkansas for Medical Sciences, Little Rock, Arkansas, focused on the importance of plentiful protein for the elderly in maintaining muscle mass, and in benefiting cardiovascular and bone health. If you missed last week’s blog on probiotics, which included information on the proceedings from last year’s First Global Summit on the Health Effects of Yogurt, link HERE. For more information, visit on The Yogurt in Nutrition Initiative, link HERE.